Earth's neighboring planet, Mars, is closer than it has been in the past 15 years, offering unusually bright views of the Red Planet's auburn hues. "The Red Planet and Earth haven't been this close since 2003, and won't be again until 2035," NASA said. Astronomers around the world trained their telescopes on the sky on July 31, when the Red Planet was 35.8 million miles (57.6 million kilometers) away. 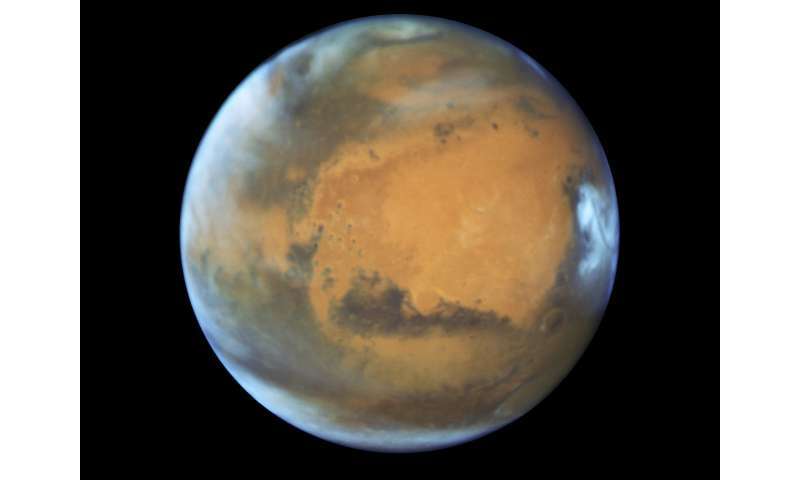 "Mars is invading us tonight," said observatory director Ed Krupp. The nearest point to Earth in Mars' elliptical orbit came at around 1100 GMT on Tuesday, NASA said. Astronomers are interested in Mars' travel path because it helps decide the best times for spacecraft to launch. When the Sun, Eart and Mars are lined up, with Earth sitting in between, a phenomenon called "opposition" is in effect, giving the brightest view of Mars. But also, "around the time of opposition, a planet is at its closest distance to Earth for a given year," the US space agency explained. Since the Earth and Mars align in opposition about every two years, "this is why most NASA missions to the Red Planet are at least two years apart—to take advantage of the closer distance." This year's close approach is not a record-breaker. The minimum distance from the Earth to Mars is about 33.9 million miles (54.6 million kilometers), and is rarely achieved. The last closest approach was in 2003, when Mars was 34.6 million miles (55.7 million kilometers) from Earth "and the closest it had been in nearly 60,000 years," said NASA. Another close encounter like 2003's will not happen until the year 2287. For those who missed the closest approach, not to worry. Mars will still be visible in the night sky for the next few months. Visible now in the Southeastern sky by 9 or 10 o'clock. Bright red; can't miss it. It was the brightest thing in the sky this evening when I had a look.